AdderView CATx 4000 Series is a range of secure, KVM via CATx (x = 5, 5e, 6) switches that provide four (4) concurrent users (local, extended or global) with BIOS-level control of up to 24 multi-platform (PS/2, USB, Sun) servers. A "plug-and-play" 1U appliance, AdderView CATx 4000 is a completely self-contained system that installs in minutes combining high security, flexibility, integrated remote power control, faultless quality video and optional CD quality audio. Employing enterprise grade security (using AES 128 bit encryption and RSA 2048 bit public key authentication), AdderView CATxIP 4000 allows server-access and control to a remote user over IP, using either Java Web browser or Real VNC client software that, unlike https Web browsers, is designed specifically for secure, high performance KVM over IP applications. IP and KVM functions are fully integrated – IP and OSD menus use the same server and user databases. AdderView CATxIP 4000 Global IP user has complete reboot function, interfacing with power switches via a dedicated RS232 port. For emergency backup access while network access is unavailable, a dedicated modem port allows dial-up access, while still supporting high video resolution of up to 1600 x 1200 resolutions with scalable windows. Extended users in the building can be located up to 1000-feet (300m) away from the servers, connected to AdderView CATx 4000 via CAT-x (x = 5, 5e, 6), using AdderView CATx 4000 User Stations which may optionally support audio and skew compensation. A local user can connect a console (monitor, keyboard, and mouse) for local access at the rack to all servers, with a choice of either PS/2 or USB keyboard and mouse control. AdderView CATx 4000 series provides exceptionally high video performance to local, remote and global users alike, supporting up to 1900 x 1440 resolutions with DDC emulation (1600 x 1200 on IP links). 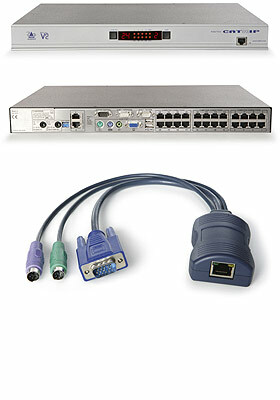 AdderView CATx 4000 switches provide CD quality (44.1 kHz, 16-bit resolution) digital stereo audio to users when optional audio-enabled Computer Interface Modules (CIMs) are used. Stereo audio is transferred through the switch digitally so that the sound fidelity is maintained. Audio is supported both at the local console and at the CAT-x extended consoles.